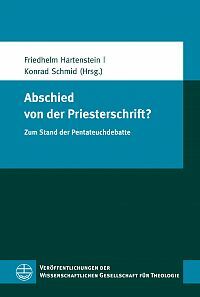 Startseite » Katalog » Theologische Literatur » Biblische Theologie » Abschied von der Priesterschrift? In the discussion on the origin of the Pentateuch, the priestly source still constitutes an undisputed reference for the different models. It is the only literary layer which can be liberated –overarchingly from Genesis to Exodus/Leviticus – from the non-priestly context by means of its concise terminology and its theological conception. However, its character as source or redaction resp. its literary integrity and range are disputed. Its character varies significantly depending on the text section under consideration (e.g. between Gn 1–11 and 12–50). Its appearance is very different, if viewed e.g. in the Exodus narrative or from the perspective of the composition of the book of Leviticus. The volume documents a conference of the section Old Testament of the Scientific Society for Theology in 2012 with contributions by Christoph Levin, Erhard Blum, Jan Christian Gertz, Christoph Berner, Thomas Römer, Eckart Otto, and Christophe Nihan.